Hello lovelies, hurray for the rain going again, although I don't like the weather too hot I don't like the rain either because it means your stuck in the house. 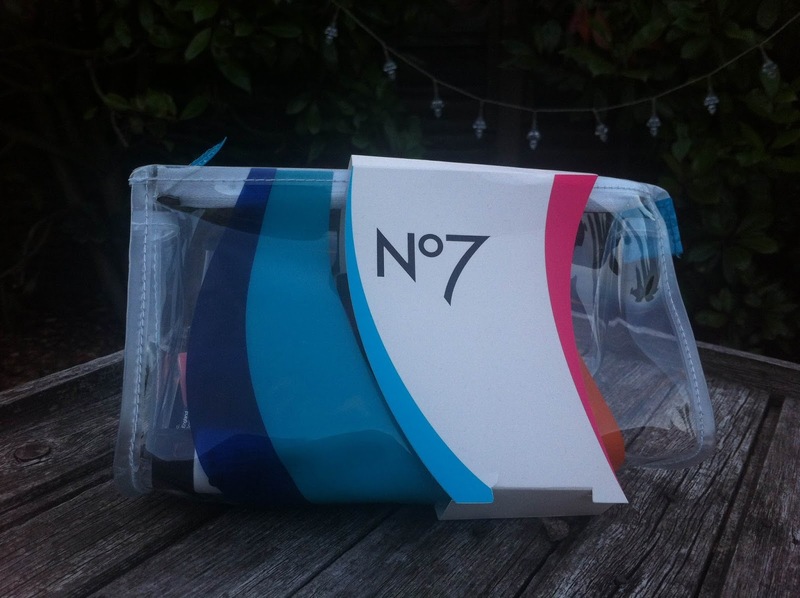 Not that that's a bad thing all the time but here is also a post to cheer you up if you love the brand No7. 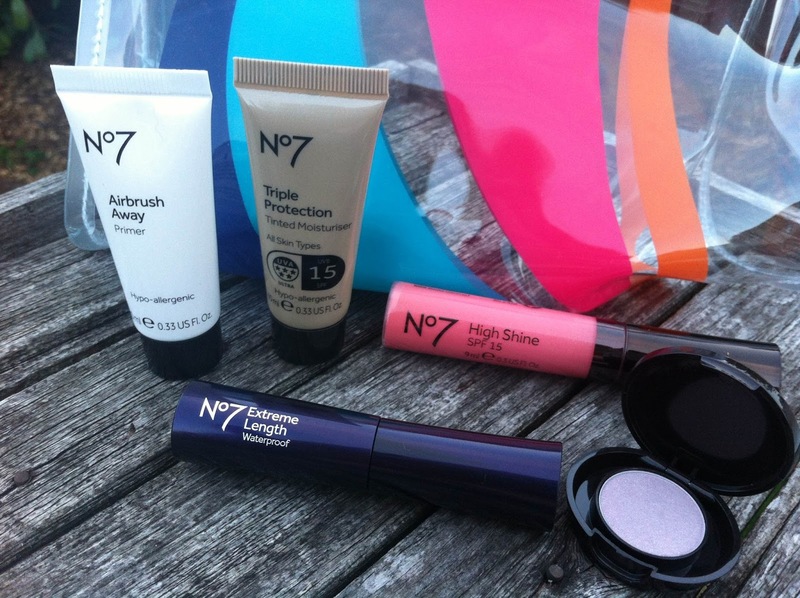 If you just buy 2 beauty products from the No7 range in Boots you get a free beauty bag full of cosmetics. I just couldn't miss this great offer. 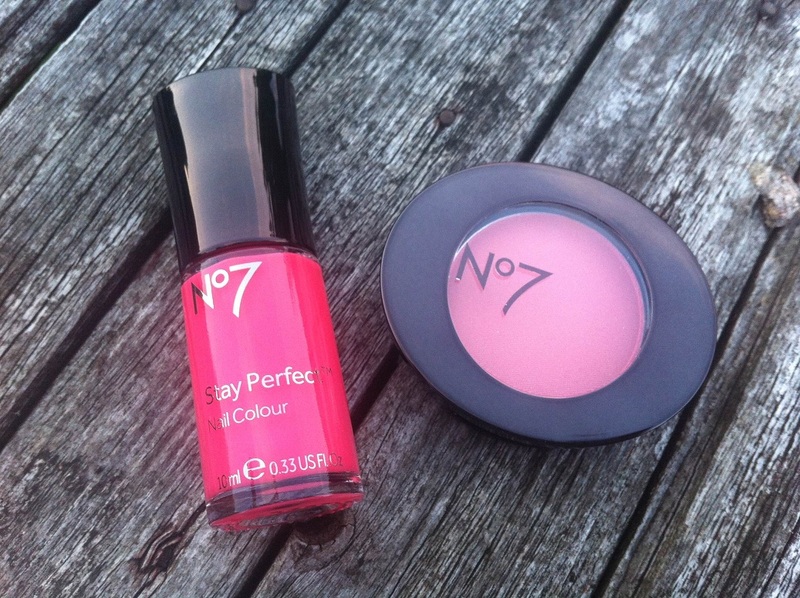 No7 Stay Perfect Nail Colour - I picked this nail polish up in the shade cheeky chops, what a gorgeous bright prink. Very rich pigmentation, quick drying effect with a glossy finish. This retails at £6.00 which is quite pricey for a polish that I never normally would purchase but i did and looking forward to its chip factor! The brush is a decent size so looks like it will glide over the nail just nicely. 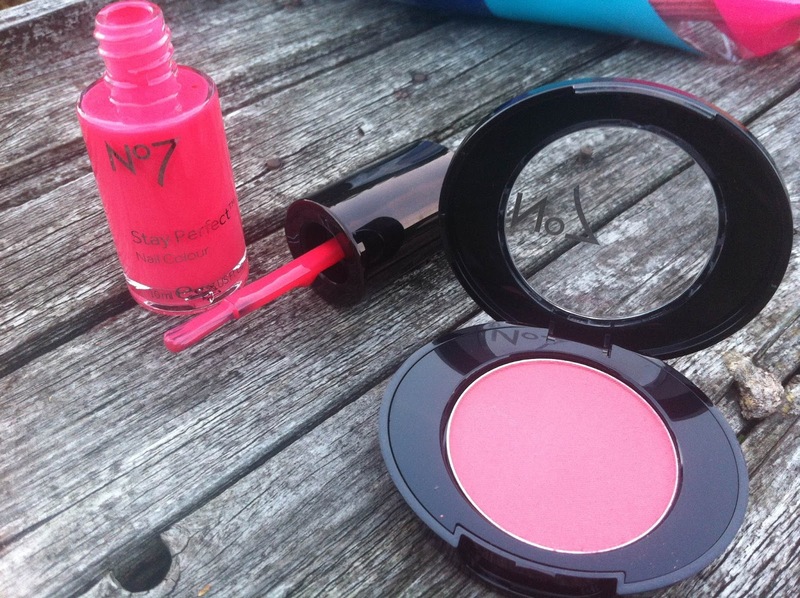 No7 Natural Blush Tint Powder - I got this in the shade coral flush, it is a gorgeous blusher not strong in pigmentation but just right. Coraly pink notes fluttering on your cheeks would look perfect for day or night on any skin tone I think. It comes in nice compact packaging too so easier enough to slip in to your make up or travel bag. 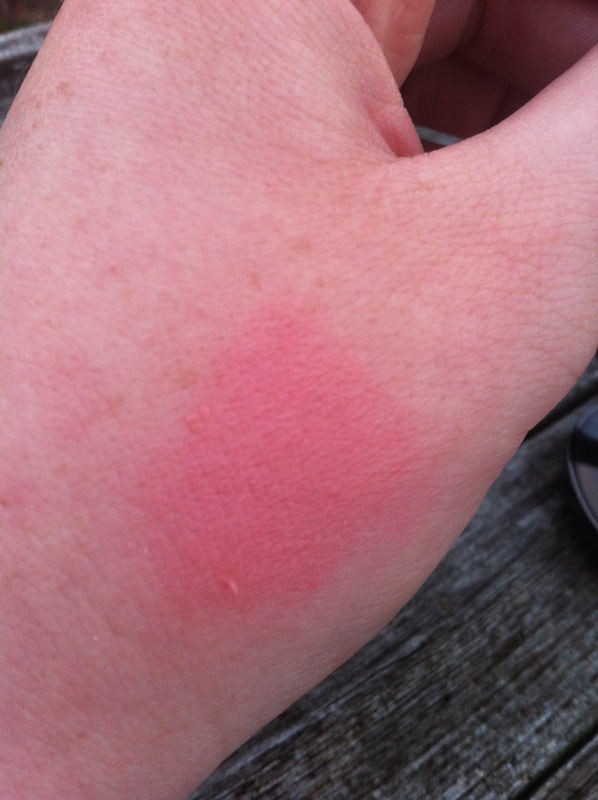 This costs £8.00 in Boots. Considering all I spent was £14 to get a free gift worth £30 is a pretty good deal to me. Check out the free goodies. No7 Airbrush Away Primer - A hypo-allergenic primer that magics away signs of ageing noticeable signs straight away it says. It smooths out fine lines, wrinkles, puts uneven skin tones and pores into a soft focus. I am looking forward to trying this with my troubled pores at the minute to see how much of a difference this makes. For 30ml this retails at £19.50 that is very pricey for my price ranges but I shall put it to the test to see if its worth that pricey tag. 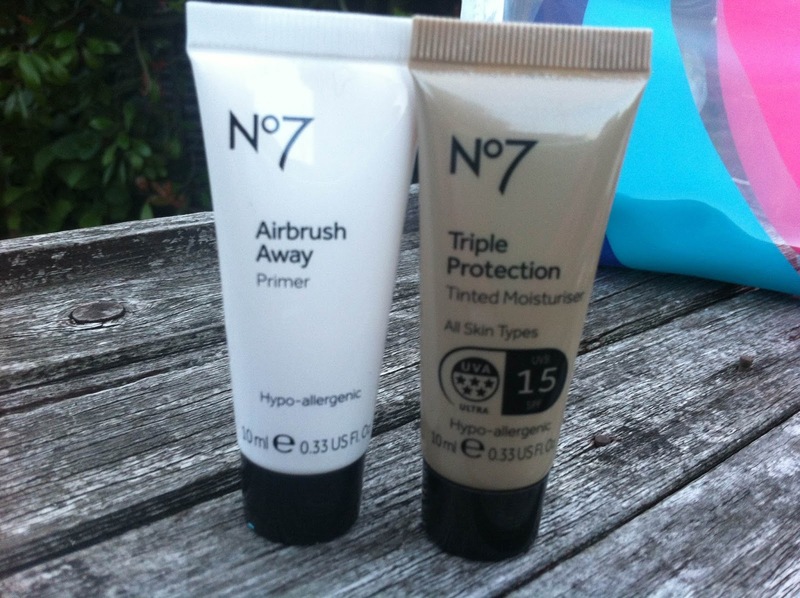 No7 Triple Protection Tinted Moisturiser - I recieved the sample in shade Fair Medium, it says it will make you achieve natural skin perfecting colour with this sheer, light diffusing tinted moisturiser that delivers all day hydration and protection. 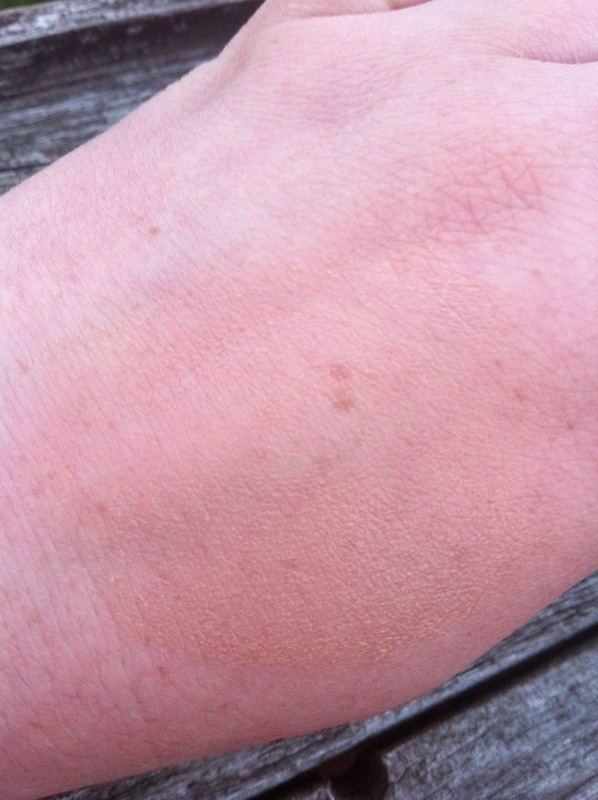 Once I swatched some on my hand I thought it looked too dark then I rubbed it in and it was a perfect match. 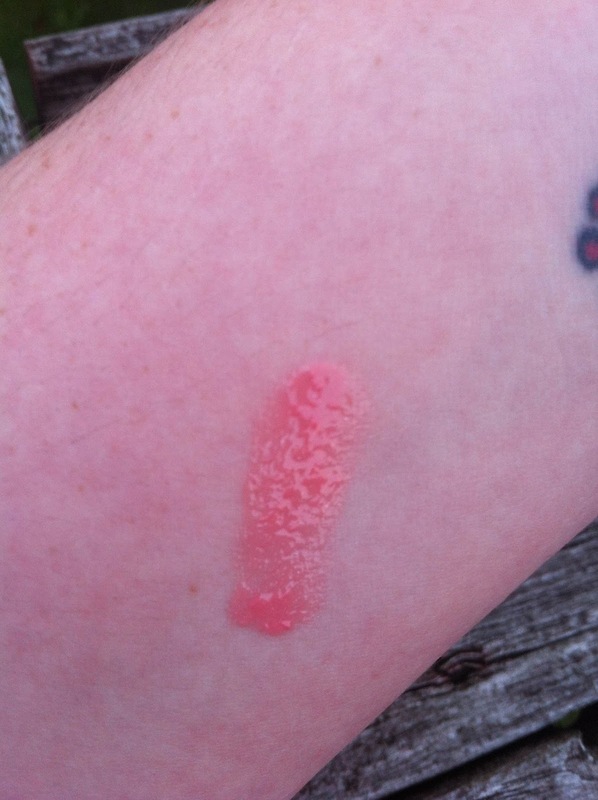 I love tinted moisturisers in the hot weather as there so light and better for your skin. So I shall be testing this out in the morning. This retails at £11.50 not too bad of a price tag. 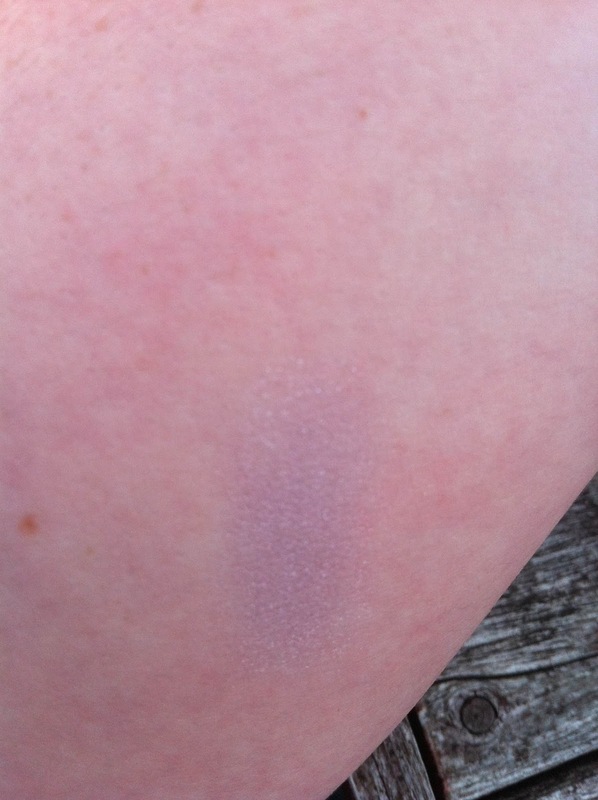 A swatch and partially blended. 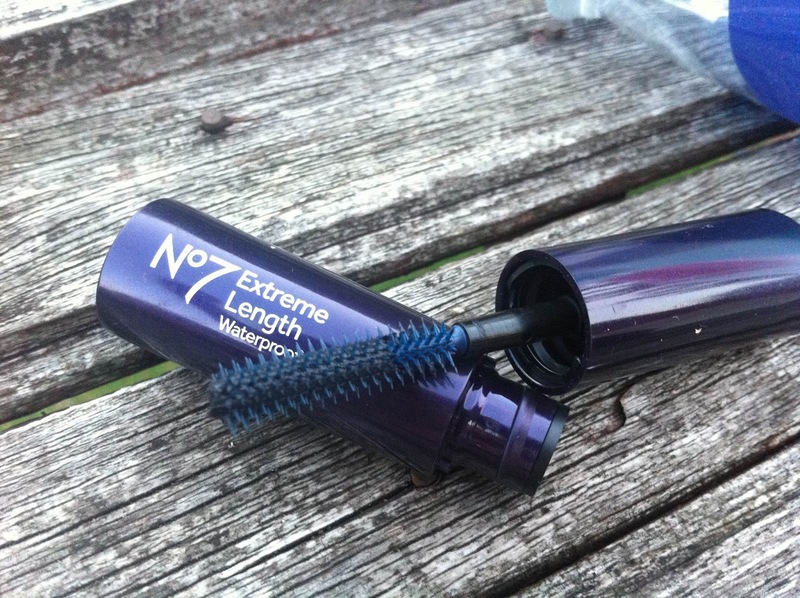 No7 Extreme Length Waterproof Mascara - The wand on this mascara looks very intriguing! 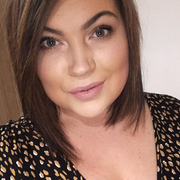 I'm looking forward to if it gives me extra length, I love length in my lashes but I also love thick colour to them too. But I'm glad this doesn't clump at least it says it shouldn't. I never buy waterproof mascara but I do think there practical in the heat and for holidays and this dinky size will be perfect to slip in your beach bag or your make up bag. Shall do a before and after picture for you. This retails at £12.50. 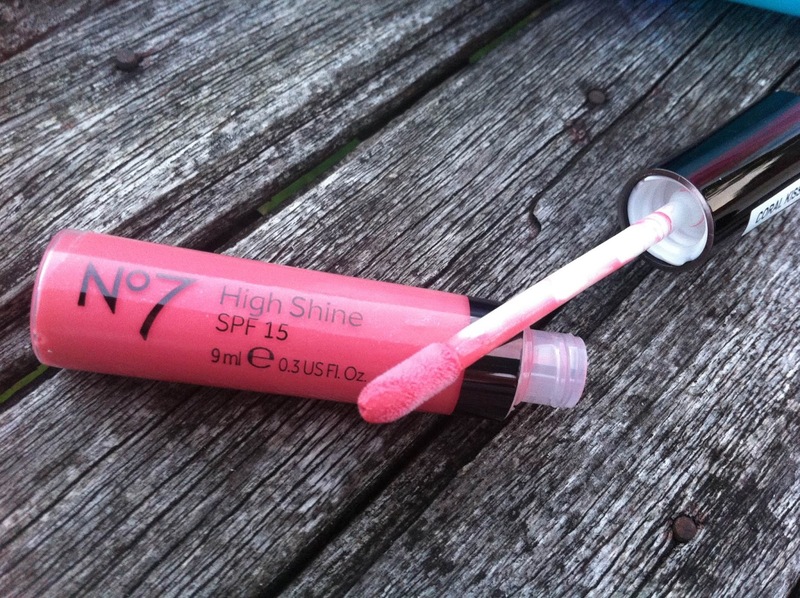 No7 High Shine SPF15 Lipgloss - I am not a huge fan of this lip gloss after trying it quickly on my lips, its one of those sticky lip gloss textures and I really don't like that. But the colour is so pretty it is coral kiss a beautiful coraly pink with quite a sheer finish but enough to give your lips a flush of colour. This will be perfect for my nan she loves her lip glosses and lip sticks so I shall gift this to her. It retails at £8.50 which I think is pricey for a lip gloss especially when its not a nice enough texture unless its just my personal preference. 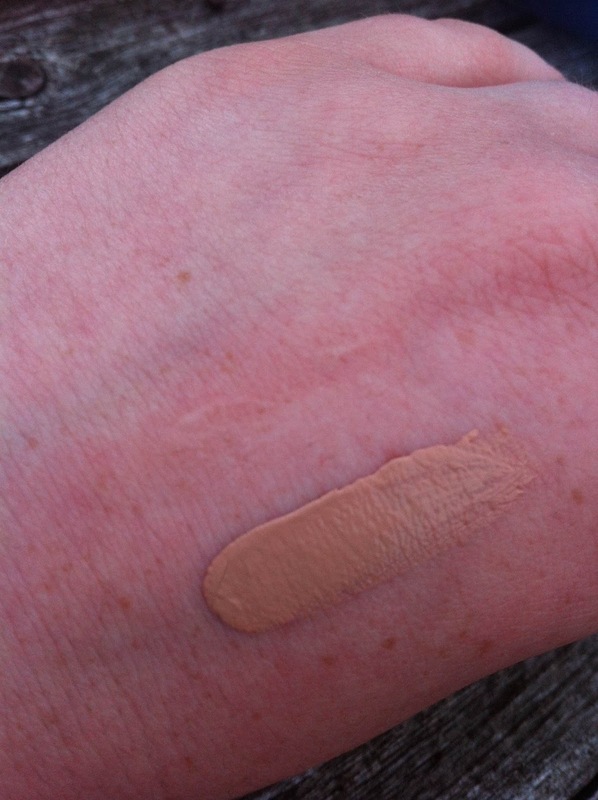 The swatch looks as if it is very pigmented but once its applied to the lips it is quite sheer. 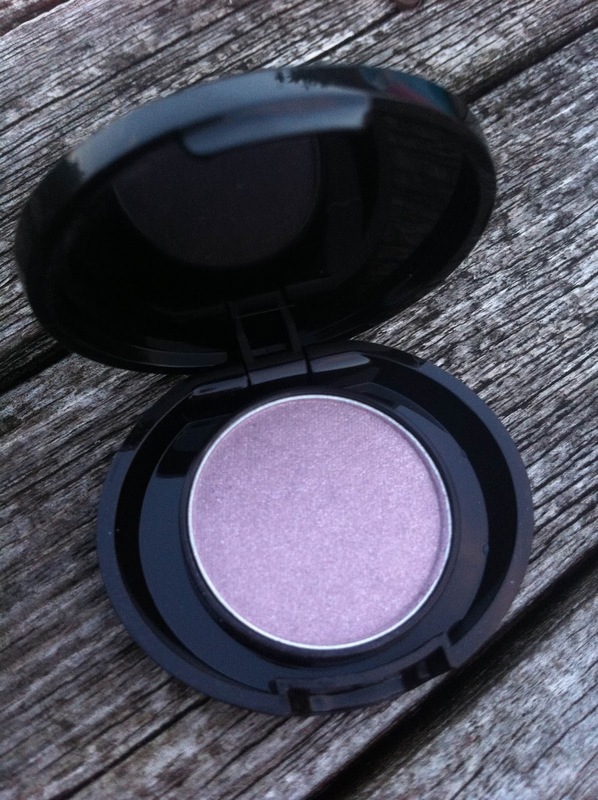 No7 Stay Perfect Eyeshadow - I got this in the shade lilac shine and that it is, a beautiful lilac shimmer shadow. I never usually wear lilac's but I am stepping out of my neutral comfort zone and testing out new colours on my eyes so I shall look forward to making a look out of this. In a cute compact packaging too that wouldn't take up any room in your make up bag! This retails at £7.00 pigmented and gorgeous colour so not a bad price tag. After receiving all these goodies I even love the clear beauty bag with flashes of colours it all comes in which I shall be using to store my cosmetics in. 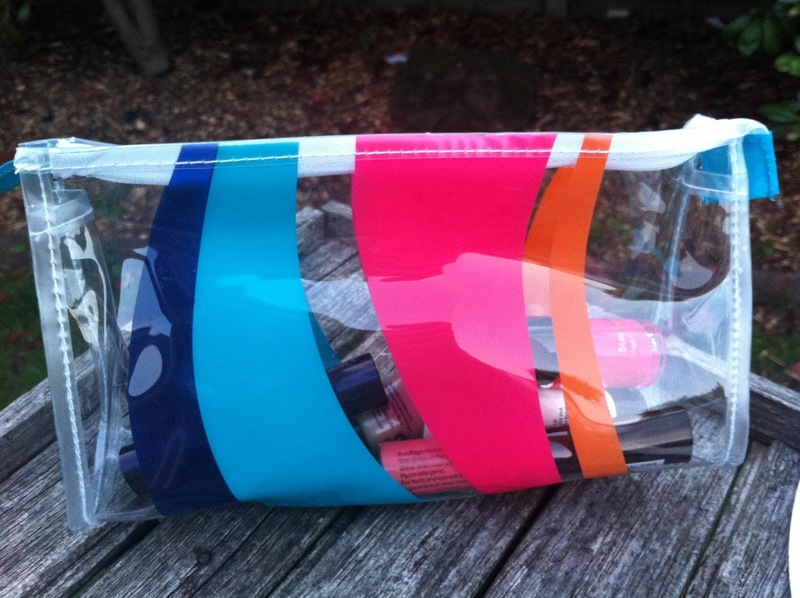 I think its a gorgeous little bag with enough space to fit in lots of your cosmetic goodness! Has anyone else out there indulged in this offer or thinking about it now?